There is one thing every DBA knows with certainty, and that is that databases grow with time. MDFs grow, backups grow, and it never stops. The more data we have, the more work SQL Server has to perform in order to deal with it all; whether it’s executing a query on a table with 10 million rows, or backing up a 5 TB database. Whether we like it or not, we are fighting a losing battle, and DBA’s can’t reverse the information explosion. Or can we? While we can’t stop growth, SQL Server 2008 and later, gives us some tools to help us better deal with all this data, and that is the promise of compression. Given the right circumstances, DBAs can use data compression (Enterprise Edition only, or alternatively take a look at Red Gate SQL Storage Compress) to reduce the size of our MDFS, and backup compression can help us reduce the amount of space our backups take. Not only does compression reduce physical file sizes, it reduces disk I/O, which can greatly enhance the performance of many database applications, along with database backups. When we discuss SQL Server compression, we need to think of it two different ways. First, there is data compression, which includes row-level and page-level compression that occurs within the MDF files of our databases. Second, there is backup compression, which occurs only when data is backed up. While both of these are forms of compression, they are architected differently. Because of this, it is important to treat them separately. In this blog post, I will mainly focus on data compression. Row-level Data Compression: Row-level data compression is essentially turning fixed length data types into variable length data types, freeing up empty space. It also has the ability to ignore zero and null values, saving additional space. In turn, more rows can fit into a single data page. Page-level Data Compression: Page-level data compression starts with row-level data compression, then adds two additional compression features: prefix and dictionary compression. We will take a look at what this means a little later in this chapter. As you can imagine, page-level compression offers increased data compression over row-level compression alone. Backup Compression: Backup compression does not use row-level or page-level data compression. Instead, backup compression occurs only at the time of a backup, and it uses its own proprietary compression technique. Backup compression can be used when using, or not using, data compression, although using backup compression on a database that is already compressed using data compression may not offer additional benefits. In the next section, we will take a high-level overview of data compression, and then we will drill down into the detail of the different types of compression available with SQL Server 2008 and later. In other words, as the DBA, you must evaluate each of the above objects in your database, decide if you want to compress it, then decide whether you want to compress it using either row-level or page level compression. Once you have completed this evaluation, then you must turn on compression for that object. There is no single switch you can flip that will turn compression on or off for all the objects listed above, although you could write a Transact-SQL script to accomplish this task. Fortunately, other than turning compression on or off for the above objects, you don’t have to do anything else to enable compression. You don’t have to re-architect your database or your application, as data compression is entirely handled under the covers by the SQL Server Storage Engine. When data is passed to the Storage Engine, it is compressed and stored in the designated compressed format (on disk and in the Buffer Cache). When the Storage Engine passes the information to another component of SQL Server, then the Storage Engine has to uncompress it. In other words, every time data has to be passed to or from the Storage Engine, it has to be compressed or uncompressed. While this does take extra CPU overhead to accomplish, in many cases, the amount of disk I/O saved by compression more than makes up for the CPU costs, boosting the overall performance of SQL Server. Here’s a simplified example. Let’s say that we want to update a row in a table, and that the row we want to update is currently stored on disk in a table that is using row-level data compression. When we execute the UPDATE statement, the Relational Engine (Query Processor) parses, compiles, and optimizes the UPDATE statement, ready to execute it. Before the statement can be executed, the Relational Engine needs the row of data that is currently stored on disk in the compressed format, so the Relational Engine requests the data by asking the Storage Engine to go get it. The Storage Engine (with the help of the SQLOS) goes and gets the compressed data from disk and brings it into the Data Cache, where the data continues to remain in its compressed format. Once the data is in the Data Cache, the row is handed off to the Relational Engine from the Storage Engine. During this pass off, the compressed row is uncompressed and given to the Relational Engine to UPDATE. Once the row has been updated, it is then passed back to the Storage Engine, where is it again compressed and stored in the Data Cache. At some point, the row will be flushed to disk, where it is stored on disk in its compressed format. Data compression offers many benefits. Besides the obvious one of reducing the amount of physical disk space required to store data—and the disk I/O needed to write and read it—it also reduces the amount of Data Cache memory needed to store data in the Data Cache. This in turn allows more data to be stored in the Data Cache, reducing the need for SQL Server to access the disk to get data, as the data is now more likely to be in memory than disk, further reducing disk I/O. Just as data compression offers benefits, so it has some disadvantages. Using compression uses up additional CPU cycles. If your server has plenty to spare, then you have no problem. But if your server is already experiencing a CPU bottleneck, then perhaps compression is better left turned off. Reducing the amount of metadata used to store a row. Storing fixed length numeric data types as if they were variable-length data types. For example, if you store the value 1 in a bigint data type, storage will only take 1 byte, not 8 bytes, which the bigint data types normally takes. Storing CHAR data types as variable-length data types. For example, if you have a CHAR (100) data type, and only store 10 characters in it, blank characters are not stored, thus reducing the space needed to the store data. verhead, reducing the amount of CPU resources required to implement it. It starts out by using row-level data compression to get as many rows as it can on a single page. Next, prefix compression is run. Essentially, repeating patterns of data at the beginning of the values of a given column are removed and substituted with an abbreviated reference that is stored in the compression information (CI) structure that immediately follows the page header of a data page. And last, dictionary compression is used. Dictionary compression searches for repeated values anywhere on a page and stores them in the CI. One of the major differences between prefix and dictionary compression is that prefix compression is restricted to one column, while dictionary compression works anywhere on a data page. The amount of compression provided by page-level data compression is highly dependent on the data stored in a table or index. If a lot of the data repeats itself, then compression is more efficient. If the data is more random, then little benefits can be gained using page-level compression. 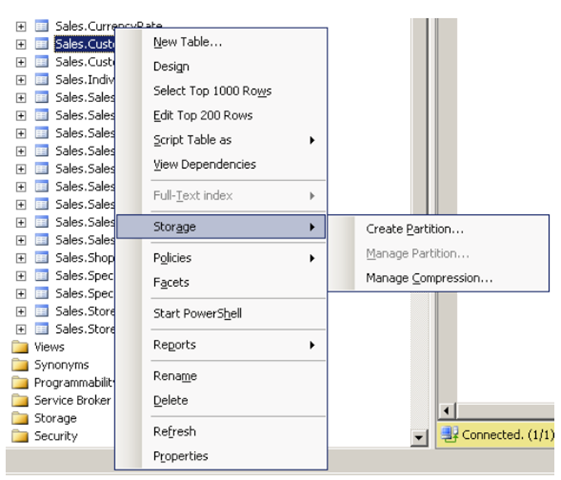 Data compression can be performed using either SQL Server Management Studio (SSMS) or by using Transact-SQL. For this demo, we will take a look at how you can compress a table that uses a clustered index, using SSMS. Figure 1: SSMS can be used to manage compression. This brings up the Data Compression Wizard, displayed below. 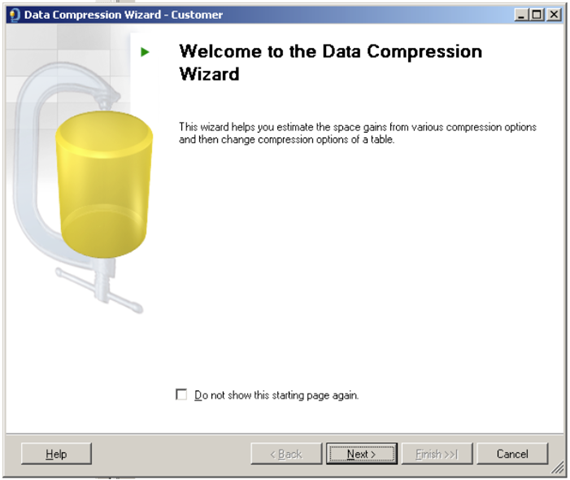 Figure 2: The Data Compression Wizard, or Transact-SQL commands, can be used to manage data compression. After clicking “Next,” the wizard displays the following screen, which allows you not only to select the compression type, but it also allows you to calculate how much space you will save once compression has been turned on. Figure 3: Use this screen to select the compression type, and to calculate how much space will be saved. Figure 4: For this table, row-level compression doesn’t offer much compression. After clicking “Calculate,” the wizard runs and calculates how much space is currently being used, and how much space would be used after row-level compression. As we can see, very little space will be saved, about 1.6%. Figure 5: Page-level compression is higher than row-level compression. After pressing “Calculate,” we see that compression has improved greatly, now saving about 20% space. At this point, if you should decide to turn on page-level compression for this table, click on the “Next” button. Figure 6: The wizard allows you several options in which to turn on compression. At the above screen, you can choose to perform the compression now (not a good idea during busy production times because the initial compression process can be very CPU and disk I/O intensive), schedule it to run later, or just to script the Transact-SQL code so you can run it at your convenience. Once you have compressed this table (a clustered index), keep in mind that any non-clustered indexes that this table may have are not automatically compressed for you. Remember, compression is based on a per object basis. If you want to compress the non-clustered indexes for this table, you will have to compress each one, one at a time. While this wizard helps you to see how much compression either method offers, it does not suggest which compression method should be used, nor does it recommend whether compression should be used at all for this object. As the DBA, it will be your job to evaluate each compressible object to determine if it should have compression enabled or not. In other words, you must decide if the benefits of compression outweigh the negatives. In this article, we have learned about the two forms of data compression, and about backup compression. While data compression might seem like a seductive new feature of SQL Server, I highly recommend that it is only used by experienced DBAs. While it offers lots of promise for increased performance, it can just as easily cause performance problems if misused. This post was updated on 3-13-2012. The original posting can be found here. This entry was posted in Database Administration, Performance Tuning. Bookmark the permalink. Brilliant insight into data compression. And also the pros and cons.Thanks, Brad. Your explanation is awesome. I have some question regarding the row compression like it does not store null and 0 values , if so then how it identifies later wherher a particular column value is 0 or null as we know null and 0 both are completely different thing. My question is does sql engine has any other storage mechanism by which it separates null and 0 values.